"An Open Letter to Michael Coe" by John L. Sorenson is an outstanding reminder of the dangers of taking a casual approach in confronting the Book of Mormon. Yes, it's easy to regurgitate old objections and feel like the case against the Book of Mormon is overwhelming. It's another matter to consider what the text really says and determine how it relates to scholarship in the relevant fields. Sorenson's response to Michael Coe merits careful consideration, though it's just a prelude to much more significant information and analysis that he is publishing shortly. Unfortunately, there's one serious problem in his letter. He refers to an article of his that can be found on a website that, sadly, has now been hacked. The website is Sino-platonic.org. Don't go there. If you do, you'll see a page proclaimed that it has been hacked. There's a risk that you'll be infected by malware if you go there, though I think I escaped unscathed. In this case, however, you can turn to the Way Back Machine at http://archive.org to view the site before it was hacked. The site in 2011 can be observed at http://web.archive.org/web/20110719183522/http://www.sino-platonic.org/. The paper John Sorenson refers to, "A Complex of Ritual and Ideology Shared by Mesoamerica and the Ancient Near East" can be found at http://liveweb.archive.org/http://sino-platonic.org/complete/spp195_mesoamerica.pdf. If someone could let John or the site's owner know of the hacking, it would be appreciated. I only have a couple of minutes tonight and have to run. I'll soon be reviewing one of the best and most thoughtful anti-Mormon books I've read. It's one of the very few that recognize that there has been interesting scholarship on the plausibility of the Book of Mormon. Rather than dismiss all evidence or, as many do, simply ignore it, this book attempts to explain how a brilliant mastermind, Sidney Rigdon, was able to pull together information from the Middle East and from scholarly sources to create a book with the trappings of plausibility, laced with internal evidences of Semitic origins and ancient roots. The book is intriguing and novel in some of its arguments, but breaks down terribly when it begins to confront and then ignore the most compelling evidence for the reality of the Book of Mormon from the lives of its many witnesses. In the case of Martin Harris, a man known throughout his life for his honesty and integrity, our author cannot simply call him a con-man working to rip off gullible believers. This is a man who would sacrifice great wealth and risk his reputation for the laughable cause of the Book of Mormon. He bore witness throughout his life, even after leaving the Church over differences with Joseph Smith, that the Book of Mormon was real, that he saw the plates and saw the Angel Moroni and heard the voice of God testifying that it was true. How do we account for that? Simple, people. Sidney Rigdon was hiding behind a tree, acting as the, uh, voice of the invisible Angel Moroni, with group hysteria and peer pressure forcing poor gullible Martin to think he was seeing an angel. "Come on Martin, have more faith. Now can you see him? Sort of? Pray harder. We can see him, can't you? And the plates, too, right? Mmm, shiny..." And then the deep voice of Sidney Rigdon coming from behind a tree provided all the evidence Martin would need to go on and mortgage his farm and put his life on the line, becoming a lifelong witness for the reality, the physical reality, of the gold plates. Well done, Sidney! The story of the many Book of Mormon witnesses and their lifelong commitment to what they experienced is one of the most difficult things to account for in any paradigm based upon Joseph Smith acting as a con-man. Read a little about Martin Harris and his life, and then ponder just how melodious Signey's voice would have to be to explain how that experience would so transform Martin. I think that my favorite thing about the Gospel of Jesus Christ and the lifestyle that is taught and practiced by faithful members of The Church of Jesus Christ of Latter-day Saints is how that makes this mortal life better. I mean how it makes people happier, gives them peace in their hearts and a sense of purpose, strengthens families, and ultimately brings joy, though always with sacrifice and challenges. The Gospel makes life better and helps people live happier, more meaningful lives. Yes, I recognize that many people in other religions find meaning and joy in their religion, and that is one of the positives of healthy religion in general. In my biased perspective, though, I see some unusual benefits of this strange but wonderful religion, and hope you'll give it a chance. It really is a marvelous, delightful experience to encounter the blessings that are found in the Church. What is your favorite thing about the Church or about your own religion? Time to share a few photos from recent adventures. The huge tree is in Singapore (Botanical Garden), as is the fern-like plant in the last photo and the crabs. The other shots are from China, including a view from our apartment and other views mostly close to where we live, plus a rice farmer on Hainan and an egret near Hangzhou. The brooms--I've been noticing how interesting brooms and mops are in China--are in Ningbo. Finally, one image reminds me that people often talk about who is behind a mask, but rarely do we discuss who stands in front. In this case, it's 3 people who are changing the world, or at least major parts thereof. No unmasking needed. Oh, yes, and there was my little encounter with ultimate evil at Cafe 666 in Shanghai. I didn't try to eat there because I was confused by their payment options. They only accept Visa, Mastercard, and something called "the mark of the beast." Is that Paypal? Or maybe Farmville cash? Still puzzled. One of the great examples of "visible Mormonism" passed away this week. Steven R. Covey will be missed. My life was enriched by his principle-centered common-sense teachings in his secular writings, and many thousands of lives were enhanced by what he taught, regardless of their religious persuasion. What he gave the world is one of many positive things to spring from the Mountain West. My latest post on the Nauvoo Times has a title that will confuse some readers, but it was written a few days before this tragic development. Please recognize that "Got Any Dirt on Covey?" is really about religious bias and the silly fears that some people have of all things Mormon. It is definitely positive on Brother Covey. 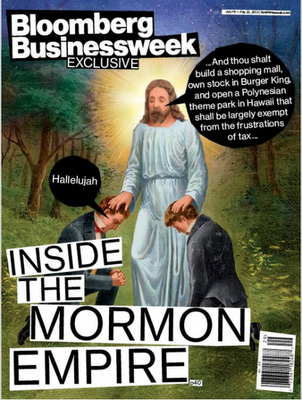 Responding to Bloomberg's Insulting Cover Story, "Inside the Mormon Empire"
Some folks are ablaze over the insulting and trashy cover on Bloomberg Businessweek's latest issue featuring a story on how the Mormon Church makes money. Painfully illustrating what can happen when once respectable publications face declining public interest in their writing, journalistic responsibility and professionalism go out the window for a cheap shot at one of America's favorite Christian religions to belittle. [Update:] The cover, if you know nothing about the Church, mocks what is considered a sacred event in the founding of The Church of Jesus Christ of Latter-day Saints. It depicts the restoration of ancient priesthood authority from God to the earth, with an angel, the resurrected John the Baptist, giving divine authority to Joseph Smith and Oliver Cowdery. That restored power would allow them to baptize one another and carry out other work leading to the founding of the Church. This was a sacred moment, one of several moments of contact between heaven and earth in the founding of the Church, and whether you believe it or not, mocking it on the cover of a business magazine simply doesn't come close to basic standards of journalism. Yes, professional journalism does actually have some standards, and Jay Evensen of the Deseret News carefully explains why Bloomberg's cover for this story is unethical and unprofessional. 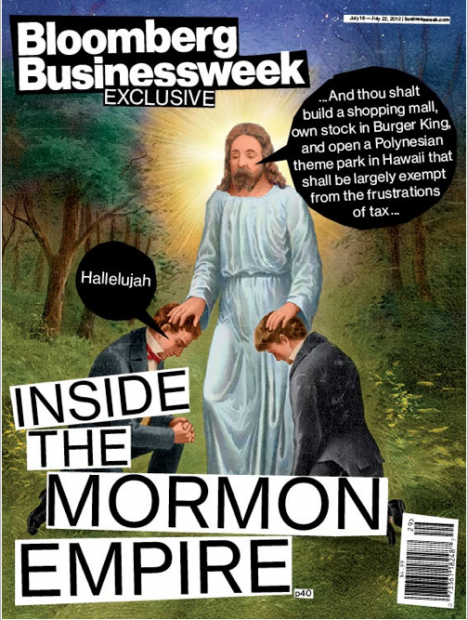 Bloomberg might do better to learn from the Church's financial independence rather than mocking it, which is what the cover clearly does, apart from whatever fair questions might be raised inside. The lessons of thrift, discipline, and sound planning in managing finances are needed more than ever in this world of instant gratification and mounting debt. But is the Church just a big financial empire now? If so, a financial empire for whose benefit? It's not Church leaders that are making billions. Many walked away from lucrative careers to serve as Church leaders. Service is about sacrifice and service, from bishops up to full-time leaders who receive a living stipend. The success of the Church in managing its finances is not driven by a desire to enrich a few powerful men, but to reach and change the world. Is it not spending enough on humanitarian needs? Is it accumulating too much? Shouldn't it have more debt and less savings? And goodness gracious, how can it support a mall? Those who are out to condemn the Church, especially in this heated election year, will easily overlook the realities of what the Church does and what its message is. The Church, fortunately, has issued a statement to remind us of what they are about, and I think it's a fair and timely statement that deserves to be considered. From the Church's newsroom, read "The Church and Its Financial Independence," dated July 12, 2012. Driven from place to place — from Missouri to Illinois to the far reaches of the western frontier — Church members several times abandoned their homes, farms and cottage businesses they had lovingly nurtured. By the time they made the final great trek across the American Plains to the Rocky Mountains, many were already impoverished. Those who came by handcarts because they could not afford wagons are a poignant testimony to that fact. Brigham Young once remarked that if the Latter-day Saints could have 10 years unmolested in the Rocky Mountain valleys, they would establish themselves as an independent people. Over time, Brigham Young’s vision of a thrifty, independent and spiritual people largely came to be realized. Complete financial independence and freedom from debt would take several decades, however. Historians today point to the early 1900s as the time when the Church finally began to turn the corner and free itself from decades of indebtedness — specifically highlighting a sermon by Church President Lorenzo Snow in which he called on the Latter-day Saints to renew their commitment to the principle of tithing. Tithing is an ancient biblical principle and has been practiced by many churches through the centuries. Independent studies show, however, that nowhere else in America today is the principle of tithing so widely and faithfully followed as among members of The Church of Jesus Christ of Latter-day Saints. The vast majority of the income used to manage the Church comes from tithing, not from businesses or investments. Tithing has thus proved to be an enormous blessing to the Church and its people, along with simple but sound economic principles such as avoiding debt, living within one’s means and setting aside funds for a rainy day. The key to understanding Church finances is to understand that they are a means to an end. They allow the Church to carry out its religious mission across the world. Does the Church own for-profit businesses? Yes. In the Church’s earlier history as it was establishing itself in the remote Intermountain West, some of those businesses were necessitated by the simple fact that they didn’t exist elsewhere in the community. Gradually, as private businesses developed and the need for Church-owned businesses diminished, they were sold off, donated to the community or discontinued. Zions Bank and the LDS Hospital system are examples. Today, the Church’s business assets support the Church’s mission and principles by serving as a rainy day fund. Agricultural holdings now operated as for-profit enterprises can be converted into welfare farms in the event of a global food crisis. Companies such as KSL Television and the Deseret News provide strategically valuable communication tools. From time to time, some people, including journalists, try to attach a monetary value to the Church in the same way they would assess the assets of a commercial corporation. Such comparisons simply do not hold up. For instance, a corporation’s branch offices or retail outlets have to be financially justified as a source of profit. But every time The Church of Jesus Christ of Latter-day Saints builds a place of worship, the building becomes a consumer of assets and a financial obligation that has to be met through worldwide member donations. The ongoing maintenance and upkeep, utilities and use of the building can only be achieved as long as faithful members continue to support the Church. On occasion someone will try to estimate the Church’s income and determine how much of that is used to care for the poor and needy. Again, they rarely capture the whole picture. The bedrock principles underlying the Church’s welfare and humanitarian efforts are Christlike service and self-reliance. Nearly 30,000 bishops who oversee their respective congregations have direct access to Church funds to care for those in need, as they help members achieve self-sufficiency. At Welfare Square in Salt Lake City, where the Church cans goods for its distribution warehouses, some procedures would be more efficient if automated. Instead, the Church has opted for more labor-intensive production lines that provide opportunities for people to give service and for welfare recipients to work for what they get. This is not the pattern of a commercial business, but it is the pattern for helping people to help themselves. The Church’s aim is to help individuals to overcome temporal barriers as they pursue spiritual values. Published numbers related to our humanitarian efforts include only dollars spent directly on humanitarian service. The Church absorbs the administrative costs. Furthermore, these numbers do not reflect the Church’s extensive welfare and employment services that serve many thousands worldwide. They also do not represent Deseret Industries thrift stores that provide vouchers to other charities for their use, donations to food pantries, or humanitarian- or welfare-focused missionary service or support given to aid other relief organizations in their missions. Hundreds of thousands of hours of donated service underpin Church programs such as these. In my former work as a bishop and in roles in stake callings, I've seen a good deal regarding how the Church manages its money including tithing and other funds, how it makes decisions regarding buildings and other projects, and have seen and felt the principles behind its activities. It's cautious, careful, and generally wise, and I saw nothing pointing to financial motives dominating its work. The claim to be engaged in blessing mankind with the spread of the Gospel as well as humanitarian and compassionate service rings much more true than hollow claims that it's about financial wealth. Say, is there any chance that politics is playing a role in Bloomberg's attack on the Church? Naw, not in a sacred election year! OK, Bloomberg, you've played your role well. Too bad that role isn't journalism. And too bad it doesn't include high artistic standards. I mean, the artwork on the cover just looks so cheesy. Let's have higher standards for your next trashy cover, please. Maybe something on Jeremiah Wright, I suppose? Archaeological sites in the Mediterranean show evidence of centuries of experimentation with iron during the era of merging of the Homeric texts, resulting eventually in a "broadly based iron economy" (30) with highly skilled artisans. The high regard given to such artisans is implied in two Homeric scenes in which royal or divine metal workers bring the tools of ironworking to fashion precious metals (7). In Odyssey 3:432-435, Nestor’s goldsmith assembles hammer, anvil, and tongs to gild the horns of a sacrificial ox, when simply wrapping the horns with gold leaf would do. In Iliad 18:468-477, Hephaestus fashions Achilles’ arms and armor out of gold, bronze, and tin, using impressive but superfluous ironworking tools. If the association of ironworking with royal sacrifice and divine artistry is intentional, the honor given to ironworking in these passages is due to recognition of the exceedingly useful nature of steel, the wondrous technology of its production, or both. Certainly, the association of ironworking with religious ritual is not confined to the Homeric poems. The location of 10th C B.C.E. iron artifacts from Taanach, in Palestine, suggests that smithing or repair of iron objects had a sacred dimension (12), resulting perhaps from some mystical understanding of the metal or from the simple desire of those in power to control a lucrative product. Indeed, the mystical and sacred aspects of iron working and steel, discussed by Ruth Russo in more detail in her article cited above, and its rare and precious nature in Nephi's day, are consistent with the sword of Laban being a sacred artifact and with the precious nature of iron in the Book of Mormon. It seems that this would not be something Joseph Smith would have derived from his environment in the 1800s. The development of steel, of course, made iron production essential. Indeed, 1200 BC is a commonly accepted date not only for the start of the Iron Age, but also for the discovery of carburization of iron. While the location of this discovery remains uncertain, it appears that in the Hittite kingdom, a blacksmith discovered how to make steel by heating iron in contact with carbon. But the production of steel was probably quite random at first. Throughout the eastern Mediterranean area in the first two centuries of the Iron Age, iron weapons appear alongside bronze weapons, with no evidence that iron provided any military advantage over bronze weapons. Cramer interprets evidence from archaeological finds to point to a copper shortage as the driving force that led to the iron age and the need for further development of steel as a metal equivalent or superior to bronze for utilitarian purposes. But there should be no question that carburized iron or steel, perhaps accidentally discovered, not well understood, and thus particularly valuable when it turned out well, was known in Laban's day and was used in precious artifacts such as ceremonial weapons. Readers here who are rapidly losing IQ points from reading too much of my blog should take a moment to enrich their diet with some offerings over at the PlanetKathy Blog. This unusual spot in the web comes from an LDS writer, Kathy Kidd, Queen of PlanetKathy.com and allegedly the universe, not to mention the co-author with Orson Scott Card of Lovelock, former religion editor for the Deseret News and former Associate Editor of Meridian Magazine. As an example of enjoyable writing with some insights into dealing with some of the finer aspects of the Word of Wisdom, please see"Sikh and Ye Shall Find" about her respectful and tasty encounter with a prominent Sikh leader. I just love the surprise and the ensuing gratitude. Sometimes there are tender and tasty mercies in our journey here. I've added the PlanetKathy Blog to my list of featured blog snippets at the right. One of the saddest things about China is the heavy influence of the worst parts of American culture, especially Hollywood and the movies that flow from America. In Hollywood, if you haven’t noticed, the heroes of our movies tend to be rebellious, social misfits living immoral lifestyles. The impact of these movies in China is rather unfortunate, as my Chinese tutor explained. She sees a “cultural revolution” taking place in which the culture of China is being affected–adversely–by the values imparted through American media. In Chinese culture, young people who are respectful of parents and teachers have long been the standard. But now, influenced by American movies, it is increasingly acceptable for students to be brats. Our teacher told us that some parents even worry about the good, quiet, obedient students and feel that they will be too quiet and too unpopular. They want them to be “cool” like those darling brats in the movies, and so they push them to be a little more “normal.” So the role models held up for young people have been turned on their heads, thanks in part to the negative influence of American movies. Yes, that's just anecdotal and perhaps not an accurate reflection of national trends, but the impact of America on dress and behavior is not hard to miss on the streets of China. We had been meeting with her for some time. I thought she knew us relatively well. And yet she thought we were moral libertines who had no problem with sleeping around and with the degraded, immature lifestyle embraced by Hollywood and its celebrities. Hmm, so much for the idea that people can just look into the eyes of Mormons and see something good. She looked into my eyes and saw Hugh Hefner. I wasn’t leering, really! We need to let people know who we are and what we stand for or they just won’t get it. Here in China, where we can’t do missionary work, we can still talk about our support of family values and our distaste for the values of Hollywood. And perhaps we can help like-minded people here recognize the downward pull of this second cultural revolution, made in America by but opposed by many Americans, and resist it before it causes more severe harm and pain in this great nation. And I hope you folks over there can help preserve fundamental values in your culture as well and throw out Hollywood as the source of American morality. That would be a revolution worth fighting for. Many times I've been tempted to turn off anonymous comments here at Mormanity, but I've kept them available because it makes it more convenient and less risky for people to participate in discussions. Sometimes, though, anonymity is used as a mask to make really unkind or idiotic statements that people probably wouldn't make if some aspect of their identity or their web presence were linked to their words. Comments like that are often deleted, but fortunately nearly all of the participants here rise above that level. One nasty anonymous comment, though, tempted me to remind the offender that anonymous comments aren't necessarily totally anonymous in this age. The temptation came in the form of thoughts of a playful prank. So after steaming over a vile anonymous comment that needed a more vigorous response than deletion alone, I called up my friend "Lennon" (not his real name, at least not his real spelling) at Homeland Security. "Lennon, can you help me out? I just received a vile anonymous comment on my Mormanity blog and thought it would be cool to scare that guy by coming right back with something like, 'Well, Anonymous, or should I say Frank, I see you're posting from a trailer home in Billings, Montana. Here's a tip: get rid of the plaid shirt. It makes you look fat.'" I could heard Lennon typing for a moment, then he paused. "Jeff, dude, that would be totally wrong." "Wrong? Wrong? Actually, I'm relieved to hear you use that word! Well, I guess I'm glad to see that you folks at Homeland Security still have moral--"
"No, dude, I mean you'd be totally wrong. His name isn't Frank, it's Cecil, and he's in a pretty sweet condo in San Mateo. I don't have a good cam feed but he wasn't in plaid last time we got a view. But you don't know that and didn't hear it from me. Oh, and thanks. I see the Paypal gift just showed up. Gotta get back to monitoring some Swedes in Manhattan." So, recently deleted Anonymous, or shall I say Cecil, have a happy 4th of July. Enjoy your freedom, America. And keep those anonymous comments coming ... while you still can.